While out walking the other day I came across a single, lonely buckthorn shrub-tree along one of our fencelines. It stood out from the other woody vegetation because it was the only one in the row that bore any berries. We have so few berry-bearing bushes on our property, I went up for a closer look and some photos. Buckthorn isn’t native to North America; it’s originally from western Eurasia, and was introduced to North America early in the 1800s. Given the right conditions (which includes disturbed land), buckthorn can be very invasive. It leafs out earlier than many of our native plants, giving it a longer growing season, and plants are very hard to kill – like willows, they’ll resprout from roots and stumps. One site I’ve read also suggests that the shallow, spreading root system outcompetes those of other understory plants. I’ve been to a few places where the shrub has spread and established itself over a wide area. Not a lot of fun when you have to walk through it! The name does actually refer to little hawthorn-like thorns that grow at the ends of the stems. When freshly ripe, those berries look like they ought to be tasty, but they’re actually poisonous. A handful of berries will give you abdominal pain and diarrhea; a bowlful can cause serious problems. The amount of poisonous chemical contained within the berries decreases once they’re ripe – probably a strategy the plant evolved to keep animals from eating the berries before they were ready to be dispersed. This can cause some problems for wildlife in areas where the plant has been introduced. In its native range, berry-eating birds know not to eat the berries before they’re ripe, but birds not familiar with the plant don’t have that knowledge. They may eat the berries while they’re still toxic, and suffer the consequences. ** (Edit: Reader Julie of the Rouge River Bird Observatory in Michigan comments that the author may have jumped to conclusions with the article I linked to at the **. Julie’s own research on avian use of non-native fruits has shown no such toxicity of buckthorn berries to birds. Julie knows a thing or two about a thing or two, so I’m inclined to believe her.) However, if the berries make it past ripening and into the fall, they’re an excellent source of winter nutrition for our birds. Clumps of buckthorn are great places to check out when you’re birding in the winter, because more often than not there will be waxwings or robins or bluebirds or other berry-eaters flitting about the shrubs. Many species will feed on buckthorn, but of particular interest to me are Bohemian Waxwings. The winter specialty of Bohemians is mountain-ash, also called rowan (Sorbus americana), which bears bright orange berries. In years that mountain-ash crops in the north are poor, Bohemians will move farther south looking for food. Once they reach southern Ontario the mountain-ash crops might have improved, but their diet can also be supplemented with the berries of the widespread buckthorn (by the time they make it down here, of course, the berries are well past ripe and entering shriveled). I saw a flock of Bohemians, 40 of them, while I was out this afternoon. 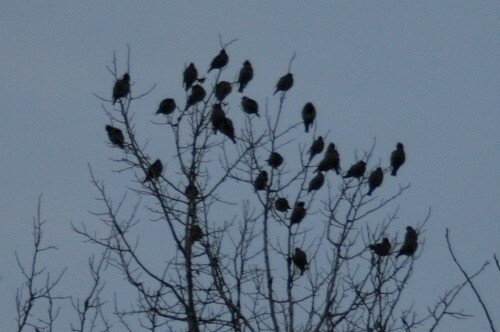 I spotted them before I heard them; they were being unusually quiet for waxwings. I had neither my binoculars nor my long lens, but the way they were all clustered at the top of a couple of trees is, from my small amount of experience, typical of the species, as was their completely unconcerned attitude as Raven and I approached to stand a short distance away. A few birds were calling, which confirmed the ID even if I couldn’t see them well. 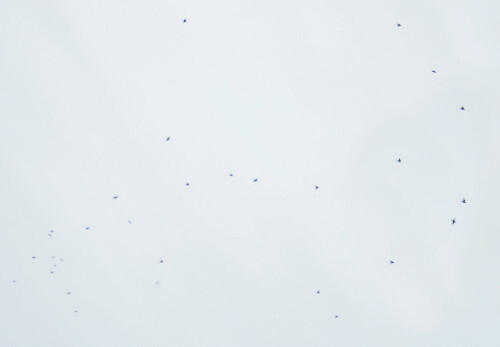 I stood and watched for several minutes before they all began to call and then abruptly departed. One buckthorn bush isn’t enough to keep them occupied for the winter, nor is our neighbour’s single crabapple tree. Still, I hope they might linger, that I might meet them again. **As per this article. Some websites are very anti-buckthorn, others are pro-buckthorn, at least in terms of its benefit to wildlife. Seabrooke, the article you refer to has misinformation, and shortly after it came out I corresponded with the author regarding it — she did a some extrapolation that ended up not being factual. 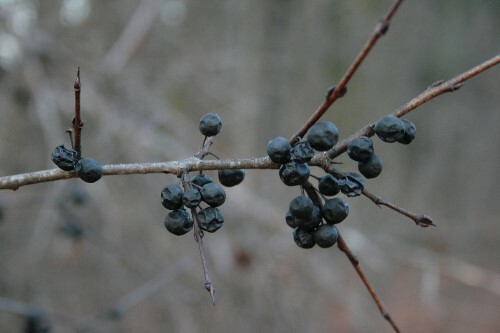 There is no proof that the compound in Rhamnus species (emodin) causes illness, diarrhea, or any other harm to birds. There were a couple of studies where a robin and chickens were force-fed artificial diets containing high concentrations of emodin that led to illness, but nothing like this occurs in nature. My research centers around non-native fruits and their importance to fall and winter birds. Buckthorns have a number of ecological liabilities, but being a threat to birds is not one of them. And I sure wish Bohemian Waxwings were a species I could observe feeding on any fruit around here! Thanks for that information, Julie! I admit I didn’t spend great amounts of time digging around the ‘net to try to get to the bottom of it, which is why I gave my source here. It seemed as though every page gave a different answer; that one at least seemed to be backed up by scientific studies and made some rational sense to me. I’ll edit the post to reflect your comments. There’ve been Bohemians reported down at Long Point already this fall – you never know, some could show up out your way! Very interesting article, Seabroke and thanks Julie for the input. 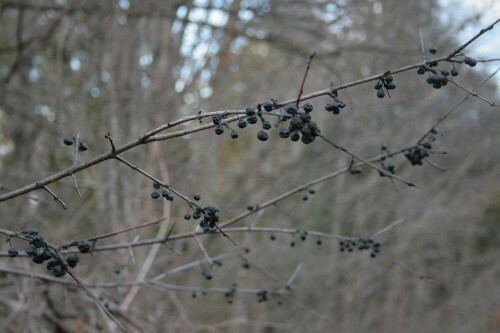 I always thought Buckthorn berries were poisonous since thats what I read about them on many websites. London is full of these bushes in some parts but I never saw a Waxwing or a Robin feeding on it. I’ve often seen birds feeding on them, Ani, so I was confused about whether they were poisonous or not. As you say, many websites indicate that they are. It would seem counter-productive for them to evolve to be poisonous since berries usually evolve as a means to tempt animals to spread the seeds for the plant. I usually see birds on the bushes in January and February, when the snow is thick and other food sources have already been exhausted. The internet’s an amazing resource, Barbara. It’s hard to imagine a time when it didn’t exist… but it wasn’t all that long ago! I noticed many Buckthorn bushes. As far as I know Buckthorn is considered as invasive plant. Yes, Guild-rez, most places categorize buckthorn as not only introduced but invasive, and it can be a problem in certain situations where the native habitat is already disturbed or weakened. Like most invasive species, it has trouble breaking into good-quality habitat, but once it’s got its foot in the door, so to speak, it takes advantage of every opening it’s given. And unfortunately, we humans give these hardy invasives many opportunities through habitat modification and pollution. What you’re seeing is Waxwing feeding on Choke Cherries…not Buckthorn. Simply desire tto say your artiicle is as astounding. take hold of yojr feed to keep up to date with coming near near post. Thanks a illion and pleasae carry on the enjoyable work. I just collected some Buckthorn berries on my walk in the UK. I hear they are poisonous on here so I’d better not eat them.